OK, those of you who have been loyal readers of my reviews already know I am not a big fan of Sauvignon Blanc. For me, choosing Sauvignon Blanc is boring. Picture going into a wonderful bakery with a shelf full of artisanal bread, and instead of buying a beautiful Rye or Pumpernickel you buy white "Wonder Bread". I know, many of you that are fans of Sauvignon Blanc have just gasped. It is one of the more popular white wines in the world. Well, not for me. I was invited to taste two different styles of Sauvignon Blanc with some wine friends. We were going to compare two South African Sauvignon Blancs with distinctly different styles. We tasted side by side and I expected my notes to reflect the same adjectives that always are placed in my Sauvignon Blanc reviews. Crisp, Tart, Citrus....you know the words. After a while, the wines and reviews for Sauvignon Blanc all blend together. Well, yesterday one of the wines surprised me. Although it still had the same adjectives for nose and flavours, there was one adjective that I cannot ever remember using as a descriptor. INTENSE! Vergelegen is located in the Stellenbosch region of South Africa. About 45 minutes from Capetown, this area is a perfect micro climate for Sauvignon Blanc. Wines from this region have been making astounding progress in increasing market share in the United States. Quality is the main reason, and reasonable prices put them over the top. Vergelegen, which means "Location Far Away", is an idyllic setting. Gardens and restored mansions fill the property. Vineyards were engineered long ago to utilize gravity for water distribution. This illustrates the pains and planning that went into making this property successful. The wine reflects this dedication to quality. This wine poured a light straw color and immediately the aromas were leaping from the glass. Grapefruit, Grass, White Flowers and some Green Pepper/Herb were all evident. The flavors were Grapefruit Rind, Flint, Guava, Fig and Mineral. The Grapefruit component was intense. This is NOT a typical Sauvignon Blanc. This is a Sauvignon Blanc with a flavour profile on steroids. All of you are not going to like this wine. Many of you are going to send me e-mails telling me I am out of my mind. What I have found over the last few years is that many of you DO have a similar palate to mine. If this is the case, it is worth finding this wine and giving it a try. I am very curious to see what you have to say. I have been hearing great things lately about Amador County wines. I have had no less then seven e-mails this week chastising me for not investigating this up and coming area 45 miles southeast of Sacramento. Being a Zin lover, I did not need much additional prompting. Four Vines Vineyard has been getting lots of critical acclaim. Founder Christian Tietje is a self proclaimed hedonist and former chef from Boston. With two partners he has greatly increased the capacity of this growing winery, without sacrificing any quality. With fifteen different wines, he and his partners are kept busy. After tasting his Dusi Zinfandel, I think they will only get busier. The wine pours a medium ruby typical of a California Zin. Aromas of Red Fruit with a bit of mint and menthol. The wine is medium bodied with generous red brier fruit, cherry, spice with a bit of anise and menthol on the finish. The tannins are well integrated making this wine easy to drink. This wine has good structure and will cellar for two or three years without any issues. Good finish, not too long, but pleasant. This would be a great wine with hearty fare like stew, pasta or braised beef. There were less then 500 cases of this wine produced. You should call around to your favorite wine store to see if they carry it. In the DC area, it is carried by Pearson's at 2436 Wisconsin Avenue, NW, D.C. It is on sale for $23 per bottle. At this price, back up the truck! Call ahead to check availability. At this price, it will go fast. I have been very lucky in life when it comes to friendships. I have been blessed with many friends, some better then others, but all wonderful. With wine, there is an important parallel. There are some wines that year in and year out provide great satisfaction and bring a smile to my face. Last night I went out to see a movie ("The Visitor"), and afterwards went for a late dinner at a new Italian restaurant in DC. While waiting for our table, I perused the wine list to see what was available. It was a short, carefully chosen list, with many of the usual suspects. When you walk into a crowded room instinctively you scan the room for a familiar face. When you find a friend, you tend to smile and walk towards them to say hello. It is a similar experience when reviewing an unfamiliar wine list. You scan the list and cannot help but find the wines you know. This was the case for me last night. Testal for me is a perennial favorite. It only took a moment for me to decide to catch up with an old friend. Corvina is the indigenous grape in the Verona region of Italy. Amarone and Ripassa are made with this grape. If you enjoy Amarone, you know that a good bottle can set you back $50 to $100 each. Although one of my favorite Italian wines, the price of Amarone can be prohibitive. Finding a substitute at a more reasonable price has been a continual quest. I was introduced to Testal 4 years ago. It was a top pick on one of the "Best Value" lists that I review every year. It was described as a "Poor Man's Amarone", which immediately caught my attention. Once I tried a bottle, it has been a perennial favorite. The 2004 vintage is no exception. This wine is produced using grapes that have been partially dried. The top vines are cut then hung at harvest. The dried grapes are then picked, pressed and placed into large oak casks to age. This drying process concentrates the juice and contributes to the rich character of this wine. The Corvina is blended with 3% Cabernet and 3% Merlot in the final blend. This has been a consistent formula for this wine from year to year. The Corvina gives the wine great structure and the addition of the Cabernet and Merlot lend a balance to the blend. The wine pours dark ruby. It has a rich nose of cherry and sweet brier fruit with a bit of vanilla and spice. The red fruit is prominent and the finish is long. Tannins are in balance, but not overabundant. While others in my group thought this wine could age for a bit, I found the tannins in balance with the fruit. This one may lay down for a short while, but why wait? It has been consistently good wine from year to year. Drink it now, and have faith that next year vintage won't disappoint. I would recommend that you have this wine with food. It is bold, and would be well suited to meats and pasta. Although it was recommended that the wine be opened an hour before serving, I don't feel it is necessary. It may be tough to find this wine at your local supermarket, but is widely distributed and worth the time to find. Let me know what you think. I suspect that once you try this wine you will like its personality. For me, that is the number one requirement for a new, or old friend. Spring has sprung in the Metro D.C. area! All of us that have been cooped up all winter are dying to break out the charcoal and enjoy a nice dinner outside. This Rose, although inexpensive, provides a big bang for the buck. Most importantly, it is made in enormous quantity, which makes it widely available. This review is for the Rose'. 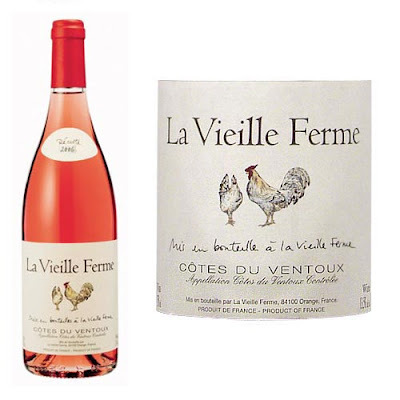 I only mention this because La Vieille Ferme (The Old Farm), also makes a very nice budget red. This wine is not a connoisseur's wine by any stretch of the imagination. It is an everyday table wine. This is a blend of 50% Cinsault, 40% Grenache and 10% Syrah. Very nice, both flavor and price. Light pink in color, it oozes the scent of strawberry and bitter cherry. Although it smells sweet, it is a nicely balanced blend with good acidity and crisp flavors. The flavour of the wine reflects the nose. Light bodied, it delivers strawberry and cherry, with a pleasant finish. This wine is custom made for grilling everything from pork chops to sausage. It goes down easy, and will be enjoyed by all who partake. Don’t be put off by the screw top. Many of the budget wines are going in this direction to save cost. It is a perfect picnic wine; no need for a corkscrew. Value is a highly overused and misunderstood term as it relates to wine. A value wine is one that gives you more then you may expect for what you have to pay. This wine, using that definition, is a winner. I have been a fan of Worthy since the first release in 2001. It is a "second label" of the super premium "Axios" brand owned by Maryland wine wholesaler Gus Kalaris. A family man, Gus named this wine after his daughter Sophia. It may be his second label, but it certainly does not play "second fiddle." This is a delicious Cabernet Blend. 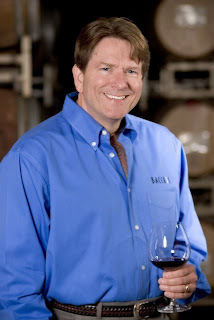 Bob Egelhoff is the winemaker for "Axios" and "Worthy". In his 20 plus years of experience, he has been involved with production of many stellar wines. Harlen, Pahlmeyer, Beckstoffer and Merryvale to name a few. He has been working as a consultant to many fine wine producers, and continues to produce quality wine for all on his client list. This wine debuted in 2001 to stellar reviews. It has been off the radar for the past few years, but has maintained consistently high quality. 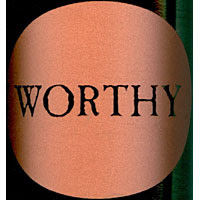 This wine has a large contingent of loyal fans that see "Worthy" as a wonderful value. I will agree. For the price, ($25 to $35) this wine is a fabulous find. The wine pours deep purple. When swirled the wine clings to the sides of the glass. Aromas of Black Fruit, Blueberry, Cassis, and Earth expand as you continue to swirl. The wine has a lush mouth feel. Black and Blue fruit, Cherry, Currant and a bit of Cassis are nicely balanced. This is a great bottle to have with a big steak. There is an abundance of oak and firm tannins which mellow a bit after the wine opens. 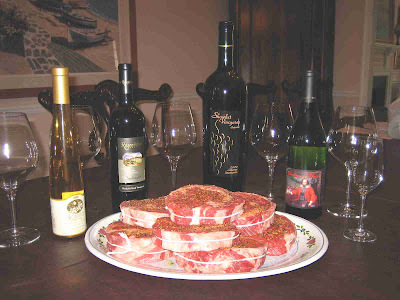 It is best to decant the 2005 or open it an hour or so before serving. This wine is beautifully balanced. Although the fruit is prominent in this wine, it does not overwhelm. Those looking for a "fruit bomb" will be disappointed. This is a serious wine that should evolve in the bottle for at least two years and lay down for six or more. That is rare for an American wine in this price range. Those with a budget of $25 for a nice everyday cab should consider making this your new favorite. Those who see $25 as a special treat, will be well rewarded. This wine is widely available, and can be found by the case in the $25 range. Give it a taste, and be sure to let me know your thoughts. I have a passion for cooking. I tend to lean toward meat and potatoes, true to my Irish roots. My favorite meal, by far, is a well marbled rib-eye steak done to medium rare on the grill. My frugality lies in direct opposition to my taste. Of course, to find some of the best rib-eye steak, you can pay up to $18 a pound. To eat steak, except on a special occasion, is cost prohibitive....or is it? Now for the confession part of this article, and I hope, some useful information. Steak that looks and tastes like steak from a premium butcher does not have to cost a fortune. For that matter, it does not have to come from a premium butcher. That's right, it really doesn't. What is the secret? Read on. When is the last time you went into your local market and spoke directly with the butcher? Never? That does not surprise me. With supermarkets getting larger and larger, and our society getting more and more tolerant of prepackaged food, few of us even realize there is a butcher there. Not only are they there...they are LONELY! Years ago, while perusing the meat aisle for some good looking rib-eyes, I was looking pretty dejected. Although the steaks were on sale at a GREAT price, there was not much for me to choose from. All of the steaks in the case were cut 1/2" thick, and looked more like minute steaks, then the big juicy rib-eyes that I envisioned. There was a meat man in the aisle restocking the ground beef who noticed my indecision and asked if he could help. I explained my frustration, told him what I needed, and he said, "No, problem...let me see what I have in the cooler". He came back with a full rib and asked how I liked my steak. He too was a steak lover, and cut me the most beautiful steaks I have ever seen. He wrapped the package and handed it to me, and I thanked him profusely for his assistance. He said....(Listen closely as this is the key to your future steak success)..."Thank you sir! Anytime I can assist, my name is Rich. Ring the bell and I am happy to cut you whatever you need!" When I got over the giddiness of finding what I wanted, I took inventory of what just occurred. Rich had just rocked my world with some awesome steaks. Being a sales type...I wrote a letter to the Big Chain Store gushing about Rich and my experience and thanking them for the service. Guess what happened two weeks later when I was looking for a nice steak? I rang the bell, the window behind the meat case opened and my new best friend Rich beamed. Before I could say hello, Rich started thanking me for the great letter I sent to his Employer. Although it was sent to the president of the company, 2 states away, the letter worked its way down the chain of command until it got back to my local supermarket. Rich was given a plaque for customer service that month and was given a small raise as a reward for his customer service. From that time onward, Rich was my personal butcher. He always went out of his way to get me the best available beef, and never disappointed me when he made recommendations. I never forgot to look him in the eye and thank him when he handed me my package. I knew that every time I thanked him I ensured the next time I came in I was top on his list. I have moved 3 times since I met Rich. In each city I moved to, I always made my way back to the butcher window and rang the bell. I always gave a genuine thank you to the butcher that helped me, and if they were good, I always wrote a letter to their boss. Needless to say, for years now I have been the recipient of some of the best beef my local store has to offer. My new personal butcher is Mike at "Bloom" supermarket in Rockville, Maryland. Mike has gone above and beyond to make my experience with him fantastic. Thank you Mike. A letter is on the way to corporate letting them know how lucky they are to have you in their employ. I look forward to working with a man that knows his craft and is proud of what he cuts. Although you are a bit further then my local store, you are worth the twenty extra miles. So there you have it. An old fashioned way to buy at newfangled markets. Ring the bell! This is the second time I have reviewed Tait's "Ball Buster". I raved about it last year when the 2005 was released, and I was looking forward to see if the wine quality would remain consistent. It has. I actually purchased this wine last year to give as a gag gift to a fellow wine geek. He had a tendency to give me a hard time about some of my reviews, so the "Ball Buster" moniker was appropriate. It was Australian, reasonably priced and certainly good for a few laughs. Well, the joke was on me. The wine was, and is, a fabulous value. The 2006 is as good as the 2005, but different. The 2005 was rich, chewy with lots of glycerin. It had good structure, and had the bones to lay down for years in the cellar. The 2005 has softer tannins. Still remarkably delicious, just softer, ready now and easier to drink. The wine is actually a blend. It is 78% Shiraz, 12% Cabernet and 10% Merlot. Each grape brings strengths to the blend. This is another case of the whole being better then the sum of its parts. Those of you that have been reading over the years know I am a sucker for a big, fruity blend. This is it. The wine pours a deep purple typical of this style Aussie Shiraz. It is lip staining purple. The nose leads with fresh asphalt, earth, lots of blue fruit, coffee and some anise on the end. The flavors are explosive. Blueberry, mocha, tar are mouth filling and satisfying. You can taste the tannins, but they are velvety, more mature and not overwhelming. I have found this wine on-line from $13.99 to $21. This wine, especially in this vintage, is a must try. Don't let the silly name or low price fool you. This is a seriously good wine! I was invited to a Ridge Vineyards tasting this evening in Arlington, VA. I can't wait to taste their portfolio. I'll be sure to report on my favorites later in the week. Please be sure to leave your comments after tasting. Let me know if you agree with my tasting notes. A good friend just returned from Portland, and picked up some Oregon Pinot Noir for us to try. We tasted three wines, all in the $20 range. Only one stood out, and for the $20 price tag, Willamette Valley Whole Cluster Pinot is a fabulous value. Oregon is a hotbed for American Pinots. There is very little difficulty in finding 20 or more at your favorite wine store. The difficulty is finding one you like at the $20 price point. Jim Bernau purchased the estate in 1983. A former plum orchard, this land was well suited to the cool climate varietals he wanted. He cleared the the old orchard and planted his first Pinot Noir, Chardonnay and Pinot Gris taking care to hand water the vines until established. For Jim, passion of the grape is shared with passion for the environment. Stewardship is a catchword in much of his winery literature. He has implemented a variety of programs to limit the winery's carbon footprint. Recycled corks, free bio fuel for his employees, credit for each returned empty bottle or cardboard shipper are just a few of the innovative programs in place. Lets talk about the wine a bit. It pours a beautiful clear ruby color. Swirling the wine releases loads of strawberry, raspberry and candied fruit aromas. You can tell from the nose this is going to be a hedonistic wine. The strawberry leads the charge when tasted, with raspberry, cherry and a bit of spice following closely. It has a nice mid-palate with an interesting cherry coke nuance. The finish, although not long, is pleasant. All too often Pinot in this range has bitterness or off tastes on the finish. The wine is generally well balanced, dangerously easy to drink, and will be a crowd-pleaser wherever served. This wine is delicious. I was genuinely surprised at the $19 price tag. I spoke with a representative of the vineyard who promised to follow up to provide some local retailers for this wine. The beauty of a smaller winery is the care they take to make their wines. The difficulty of the smaller winery is finding a reliable distribution channel for their product. It is times like these I wish I lived in Oregon. In the DC area, these wonderful wines can be found at Schneiders of Capitol Hill, Paul's, Pearson's and Rodman's all on Wisconsin Avenue in DC. Call to be sure they have the 2007 in stock, and let me know if you find the 2006....I'd love to taste them side by side. These guys have a great website. You can read all about their wines, company philosophy and more importantly, order these wine on-line. "You need to get to know your local wine merchant." Does this sound familiar? I have been preaching this theme for years now to anyone that would listen. When you finish reading this review....you will understand why. 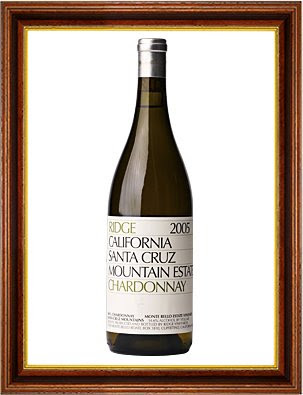 Whenever I discuss Ridge Chardonnay with my wine cronies, the first thing they say is "Ridge makes a Chardonnay?" The answer is yes, they have been producing a quality Chardonnay for years. Why haven't we ever heard about it? Probably because it is snapped up so fast it never gets much exposure on the shelf. Last spring, I went to my local wine shop to pick up some wine that I ordered. Doug Rosen, the owner of Arrowine asked me if I ever had the Ridge Chardonnay. I told him I had not, and he told me I had to try some. I clearly explained that I was a Chardonnay snob. My likes in chardonnays were limited to Kistler, Pahlmeyer and Kongsgaard; all of these wines over $75 a bottle if you can find them. He was not daunted by my response, and said,"You have got to buy some Ridge." He had the Ridge coming in the following day. I asked how much I should buy...and he recommended two cases. I clearly must have looked at him as if he were crazy. He said to buy it, and if I was not thrilled with the wine...he would take every bottle back. Let's now talk about the wine. It pours a golden yellow and is intensely aromatic. Perfume of white flowers, honeysuckle, quince and pear get your attention immediately. As you swirl, the fruit comes forward with pineapple and melon....beautiful nose. The wine is full and lush in the mouth. Great Pear and fig flavors on the front with toast and mineral rounding out a buttery finish. Brioche toast is a great description. This wine has an incredibly long finish. It is reminiscent of a mature French Montrachet. Incredible. Unlike many American Chardonnay, this one will age. You can be comfortable laying some of this down to evolve, although I cannot imagine you will want to. It is too delicious now. So, to finish my story.......I asked Doug what this wine was rated to try to get a handle on what it was like, and whether I should pull the trigger and buy the two cases. He said that as far as he knew it was not yet rated. But, he suspected it would be 90+ points, and would be impossible to find once a good rating came out. Sounded fair, so I bought the two cases. Since I took Doug's advice, the Ridge has won all sorts of awards. It was rated as Wine Spectator's #2 wine of the year, and awarded 95 points. Needless to say, it was impossible to find once these high scores and accolades were published. The best news of all? The wine was only $35. Comparably priced Chardonnay is $75 or more. Kongsgaard lists for almost $300 a bottle.....I did not pay much more then that for a whole case of the Ridge. The moral of the story is "Get to know your local wine merchant". Although this wine for 2005 is no longer available, they may be able to save you a bit of the 2006 which should be released soon. Don't miss it! Doug Rosen of Arrowine would love to be your local wine merchant. Tell him Gerry sent you! 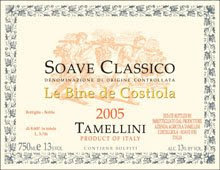 Soave Classico - "Le Bine de Costiola"
It has been a long time since I have tasted an Italian Soave. This wine is generally made from Garganega grapes that are prevalent in the Veneto growing region of Italy. Soave was most often a inexpensive bottle of wine that was made by the village cooperative. All the towns growers would pool their annual harvest and make wine out of the blended juice. Pio and Gaetano Tamellini always felt as though their vineyards were producing juice that was far superior to neighboring vineyards. In 1998 they risked it all and decided to keep their own juice to make their own wine. They hired veteran winemaker Paulo Caciorgna to oversee the wine making process. Their gamble paid off. Debbie Larson dropped this wine off to me in my office to taste. I was surprised to see Soave on the label. Rather then make assumptions about what I suspected this wine to be...I decided to take it with me to Charleston, SC over Easter break and give it a try. The wine is darker then I suspected it would be. It poured like a dessert wine, light honey colored and viscous. It clung to the sides of the glass when swirled. I could instantly smell apricots, lemon, apple pie spices and honey. The aroma was heady and pleasant. It really invited you to take your first sip. The wine was fat and unctuous. It is full of glycerin and fruit flavor. The honey and mineral component are up front with lemon, pineapple and spice on the finish. This was not the Soave that my parents used to drink with Wednesday night spaghetti dinner. This wine had the mouth feel of a good (read expensive) chardonnay and wonderful flavour combination of apricot and honey....very nice. What amazes me most is the Tamellini Brothers produced this delicious wine in a mediocre year. This is a producer that should be re-visited in better growing years to see what they can really do with good juice. I suspect the potential is there to knock our socks off. This wine has enough backbone and structure to last a few years in the cellar. It seems to be fully mature, so don't cellar it thinking it will get better. For around $20, I see this as a bargain wine. Drink it with food. The weight of the wine warrants you have something with it. I am thinking a good loaf of Italian bread, some fresh Parma cheese, and maybe some roasted red peppers with good olive oil. Any white meats....lemon chicken, fresh ham, pork roast...Mmm, Mmm, Good. I have not been able to find this widely available on the web. This is one that you will have to hunt down. Check with some of the reputable wine shops in your area, or link to one of my preferred wine shops in my "Favorite Links" on the right margin of the blog. Tonight I am going to a tasting with Louis Fabrice Latour, CEO and owner of legendary producer Louis Latour. Calvert Woodley is sponsoring, and we will taste the 2005 Red Burgundies and the 2006 White Burgundies. This should be fabulous.